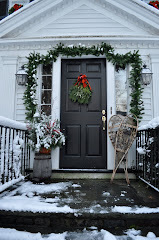 Willow Decor: Maine Coastal Gem! 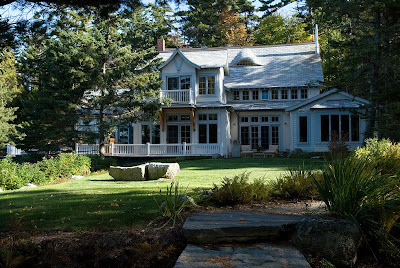 My friend, the talented interior photographer, Jamie Salomon of James R. Salomon Photography, shared this fabulous home in Bar Harbor, Maine with me recently. He was kind enough to let me provide you a private tour . 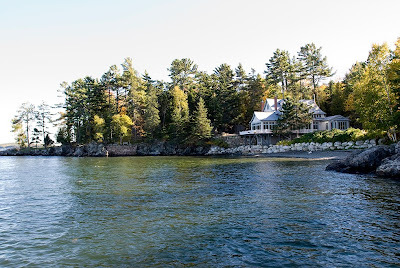 The owners of this gorgeous historical home on the water wanted to do a renovation. 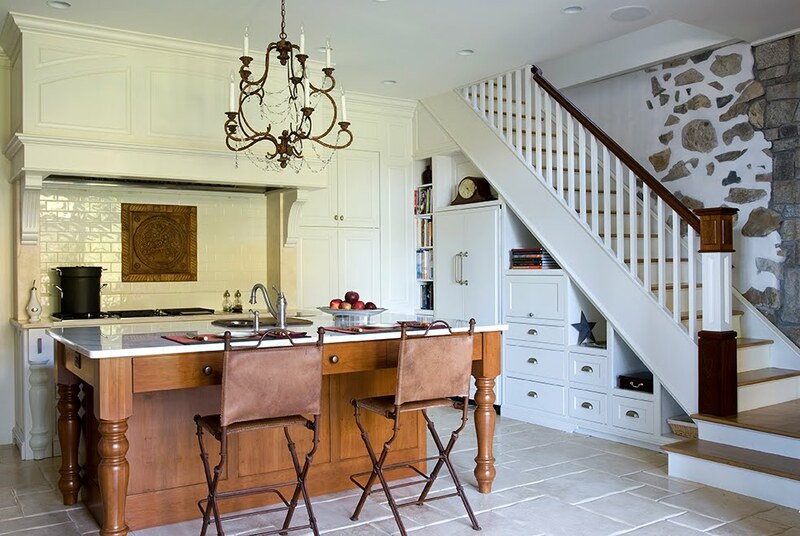 You can see how much character the home has and they wanted to keep that feeling so they called upon Anthony Barnes of Barnes Vanze Architects to help design their renovation. Let's have a look: The Entry Hall is a lovely of mix of old and new. Notice the stone arches which lead into the Dining Room. 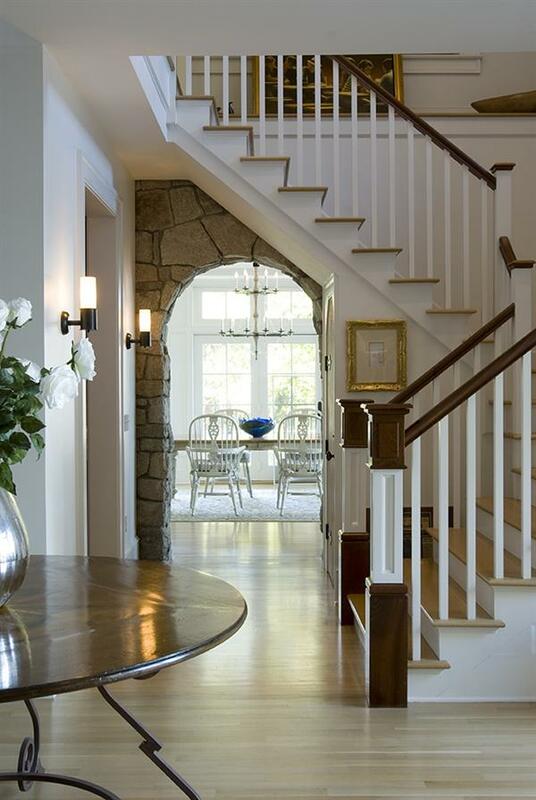 I like the choice of the wood and white paint on the staircase. The Dining Room is just beautiful. 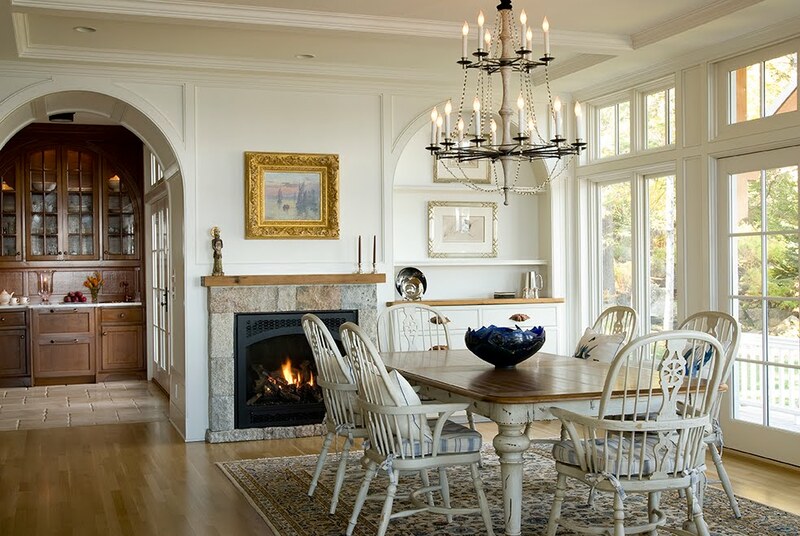 Notice how the granite stone of the archway is echoed in the stone fireplace. Also notice the detailing in this room. 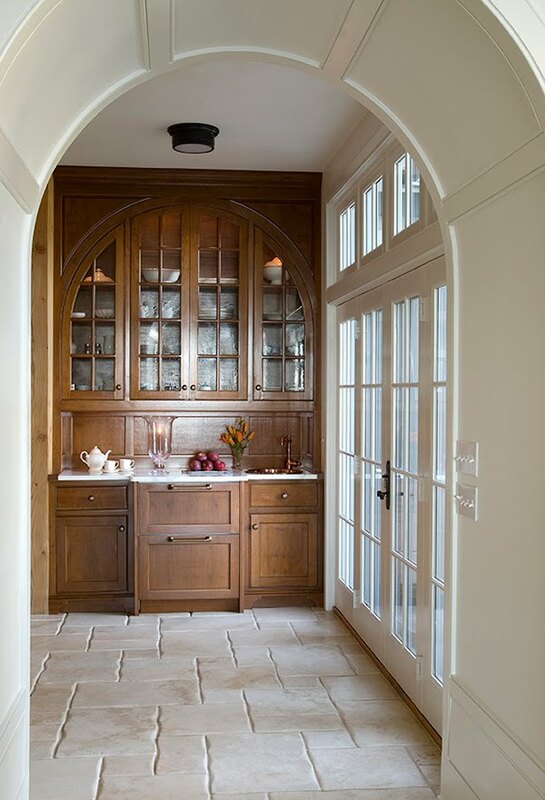 I love the wood arched doorway and the built in; they both also echo the stone archway. Peeking further you can see the stunning wood and marble Butler's Pantry. Also notice the coffered ceilings which add an additional layer of detail - the ceilings are very high, so it also brings them down a bit - I also love the turned wood chandelier. Here is a close up of the Butler's Pantry area. It is interesting to me that french doors open up right beside it. I think this is a great idea, and a very thoughtful part of the design, to have access to the Pantry for entertaining indoors and out. Great architects always think ahead! 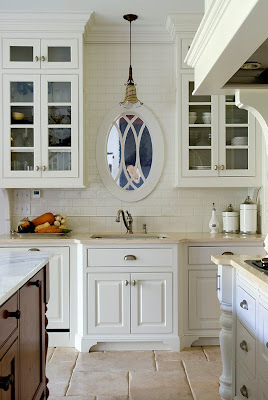 Moving to the Kitchen we see more period style details incorporated like this charming oval window over the sink. Pulling back and getting a larger view of the kitchen you can see how every inch of space was utilized including under the stairs. Also notice the stone work and the transition of stone to plaster up the staircase. I love this effect and how it cleverly solves the design problem - so you don't harshly have stone butted up against plaster. Another kitchen view where you can see an antique fireback incorporated into the white subway tile behind the stove. Wonderful combinations of old and new! The family room captures the views of the water at every turn. You can only see a bit of the fireplace, but it is also the same granite stone we have been seeing in other parts of the house. Perfect coastal decor with antiques, sisal rugs and slipcovers. Notice the ceiling detail - love it! Finally a perfect tub for a perfect retreat - Isn't this a beautiful home in Maine?? For more inspiring interiors photographed by James R. Salomon Photography click HERE. Oh, such a beautiful home! Just perfect! I love the bath tub! And all the glorious details! uhhh...STUNNING. 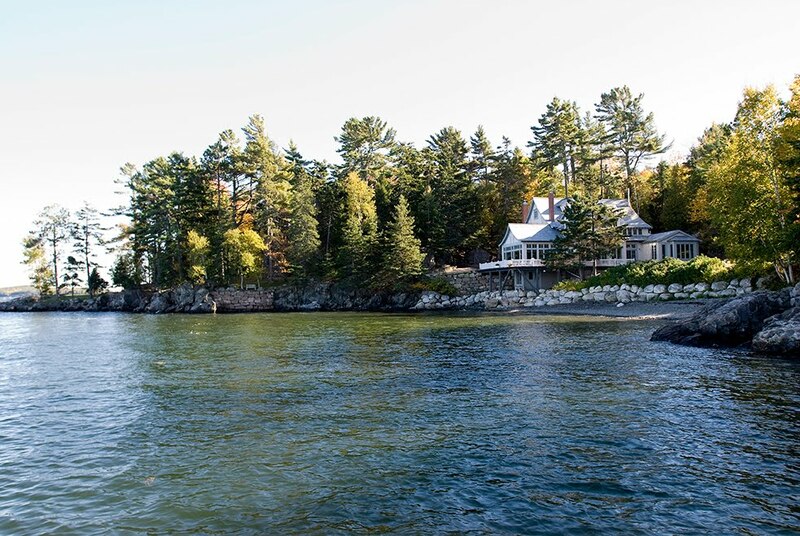 That is my pretend dream home in Maine. How did they do that? I am still waiting for someone to tell my why I can't have a butlers pantry ..
Beautiful! too bad it's not that weather today!!! , alot of our clients are started to step outside the traditional designs as well. You have a real gem! Large homes often look so over designed, but this one looks unfussy and livable and as though it's always been that way. The stones, the archways, the ceilings, the thick walls, the water! ah- so amazing!! I hope you're having a great week so far! I live in canada, but not too far from Maine and we're also on the Atlantic. The beauty here is just something that always makes me smile, but I must say that our ocean is frozen right now! Yep.. frozen.. you look at it and everything is white. Really crazy at this time of the year. This home is sweet, pretty and really relaxed at the same time. 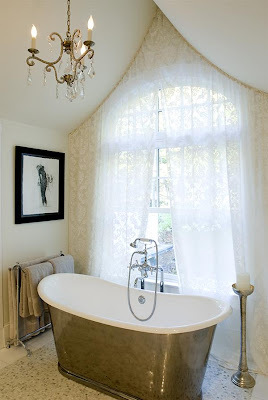 I simply love the tub and all the white and touches of blue. Sublime! I spent one year in Maine (Sugarloaf) as a Swedish au pair! I remember spending a few weeks with the family - during the summer - in Bar Harbor!!!! Don't ask me where - but I remember it was beautiful and the houses were so grand. What a house! What a setting! What a kitchen! And what a lovely architectural detail with the oval window over the sink. Thank you for letting us inside. 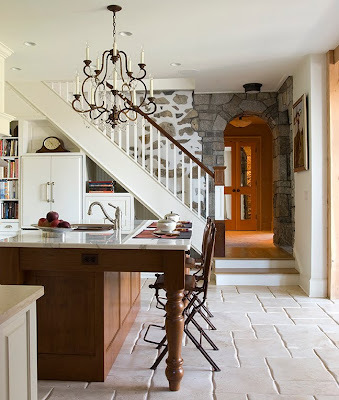 I agree... a large home that is cozy... love the stone floor and arch downstairs. Thank you for sharing. This looks very similar to the house used in Sandra Bullock's movie, The Proposal!!! Oh Am so into the scene. I'm not sure what else needs to be renovated in there but looking at it gives me my idea of a dream house. Outstanding! I have never been to Maine, but I think I could live right here and love it forever! Just a beautiful home! I really love the kitchen.I just found your blog. It's great! * Ahhhhh... So THIS is where the expression "to die for!" originated, huh? And, "How do I love thee, let me count the ways" is ANOTHER one that comes to mind!!! TRULY a most WONDERFUL, COMFY and BEAUUUUTIFUL HOME!!! So glad you shared it with us! So disappointed it's not MINE!!! That is such a great home for everyday comfort and entertaining. Nice photography. Love the white woodwork. Just came across your blog! Beautiful home. I just loved it! 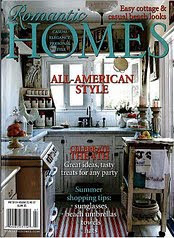 What popped for me was the arches on the doorways, the lighting fixtures, the TUB, and the fireplace in the kitchen. My dream is to have a kitchen with a little fireplace in it. Or, even a faux fireplace! Thank you for a wonderful post and I will follow along. Beautiful historical home! Nice photography! I love the design of that butler's pantry! And it makes so much sense by providing easy access to outdoor living. I love that stone peeking under the stairs. What a gorgeous home! This home is a dream!!!! Perfect! I love the idea(interior design and the overall furniture) Thanks for sharing. I really love it! If I'm going to buy a house I'll make this one a comparison. The natural light photography is exemplary! Not one shot could have been improved. The pictures beautifully told the story of the house. This is what I would call coastal perfection. Wow just perfectly beautiful, understated and inviting. Love the pictures..makes me long for a long summer day. Thank you! I'm just dropping by to invite you to take a look at my post today. I'm not sure if you know about Sarah Richardson, and if you don't I'd like you to see the work of this very talented Canadian interior designer. Let me know what you think. Love it! So many details. The kitchen is fabulous. Great bar stools. An absolutely stunning home. Love the gorgeous interior decor! What Every Princess Wants for Valentine's Day!! !